A prominent Canadian athletic therapist, osteopathic manual practitioner, teacher and author, Anne is well recognized for her knowledge and understanding of therapeutic modalities and manual therapy. She graduated from the Canadian College of Osteopathy in 1999. She is a retired professor of 32 years in the Athletic Therapy Program at Sheridan College – in Toronto Canada, and has lectured extensively in both Canada and the United States – over 300 workshops. 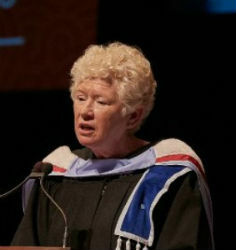 She has been awarded the status of Professor Emeritus from Sheridan College. She has been a member of the Canadian medical teams for several Pan Am, Olympic, Paralympic and International games. Anne was awarded the Hall of Fame with the Canadian Athletic Therapist Association. Anne has published two assessment texts on the upper and lower quadrant. These books are published and distributed by Anne Hartley Agency. She has also produced manuals on ultrasound, transcutaneous nerve stimulation and neuromuscular electrical stimulation. Modality charts and protocols are also published by Anne Hartley Agency for several different modalities. Additionnally, Anne maintains an active clinical practice specializing in athletic therapy, and manual techniques. She is a graduate of the Canadian College of Osteopathy with a diploma in Osteopathic Manual Practice. She specializes in many kinds of therapy including sports medicine, fascial techniques, electrical modalities, acupuncture, cranial sacral and visceral therapy. I really enjoyed the course. Anne is an excellent teacher and presenter - couldn't believe how quickly the time passed during the course. Having had Anne teach me a Sheridan, I knew the course was going to be excellent – she is without a doubt one of the most organized, if not the most organized, teachers I have ever had. As always a great course. You are such a good teacher, researcher, and practitioner. It is true, when you take a course – then it seems that the next day a patient arrives with the exact criteria from the course…the universe working in its very connected way. Kathy Harvie R. Kin. CAT(C), D.O.M.P.